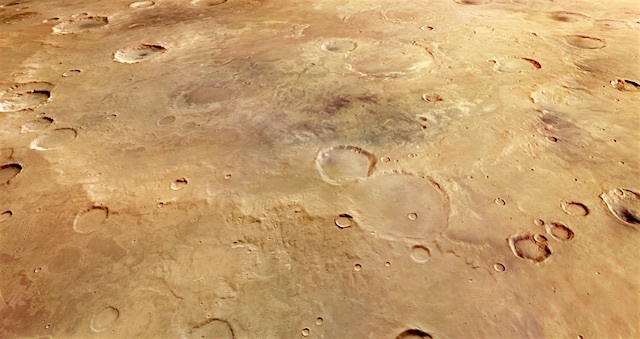 The surface of Mars may appear to be perpetually still, but its many features are ever-changing – as represented in this Mars Express view of the severely eroded Greeley impact crater. Greeley crater, named for the renowned planetary scientist Ronald Greeley, is located in one of the most ancient parts of Mars: a section of the planet’s southern highlands named Noachis Terra. This region is thought to be some four billion years old, and is thus home to many features that formed in the very earliest days of the Solar System. Many craters have formed, changed, and eroded away in Noachis Terra, and Greeley crater is no exception. The subject of these Mars Express images sits between two huge, deep impact basin plains, Argyre and Hellas, and is a great example of a very old crater that has endured significant erosion over time. This entry was posted in Reports and tagged DLR, ESA, European Space Agency, FU Berlin, Greeley Crater, High Resolution Stereo Camera, HRSC, Mars Express, MEX, Noachis Terra. Bookmark the permalink.